Antonio Conte watched his side finish the season in style as the Blues beat Sunderland 5-1 to set a Premier League record of 30 wins in a single season. 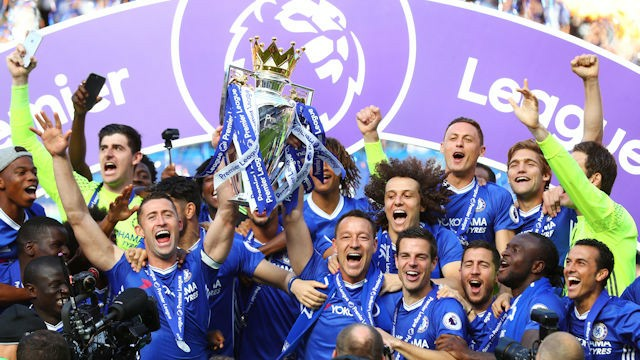 It was a day of mixed emotions as the Blues were presented with the Premier League trophy, shortly before both John Terry and Steve Holland said heartfelt goodbyes to Stamford Bridge. Conte spoke about the decision to withdraw Terry after 26 minutes, with the skipper afforded a guard of honour by his team-mates as he left the pitch. ‘I told you that it was very important to find the right solution to celebrate a great champion and a legend of the club. He deserved to start the game and then to have the substitution in the 26thminute He deserved this celebration because he wrote his Chelsea history. I wish him and his family the best in the future. For me and the club it will be a great loss because he helped me a lot on and off the pitch this season. Now we must respect his decision. ‘This is the danger. To think that this season is finished and if we win or lose it doesn’t change the situation. We must think as winners, not losers. It’s important to celebrate today and enjoy this moment. ‘This season can become fantastic if we are able to win the FA Cup. We must find the right motivation because the level is the same between ourselves and Arsenal, we lost 3-0 in the first game and then won 3-1. Now we have the opportunity to play the third game. We must find the right fire in our soul to work very hard this week and feel this game. It’s a great opportunity to win the Double. ‘I tried to find the best solution for us to bring all my players in the right form and give more minutes to the players who need to play more, then I have six days to decide the best starting 11. This season has showed when players came off the bench they were decisive for us. Even today, Pedro and Batshuayi came on and scored three goals. Michy scored at West Brom and Fabregas came off the bench and scored against Watford.